“All Aboard!” Yes, they really do say it. This was the first station where we were allowed to get off the train and stretch our legs. We were surprised at how warm it was outside, despite it being early evening. Parents chased little kids around to get the wiggles out. Some used the stop for a nicotine hit. Others like us just took advantage of the chance to get some fresh air. We suspected that the conductor got a kick out of delivering his time honored sing-songy signal, but he meant business. Within minutes we were rolling again. 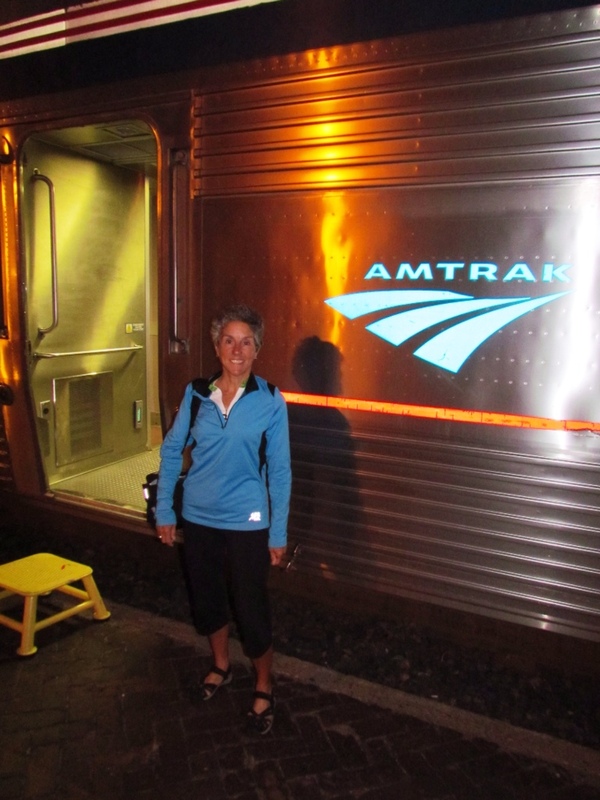 We were on Amtrak's Empire Builder. The final leg to complete our circle back to the car was a train ride from Seattle to Whitefish, Montana. 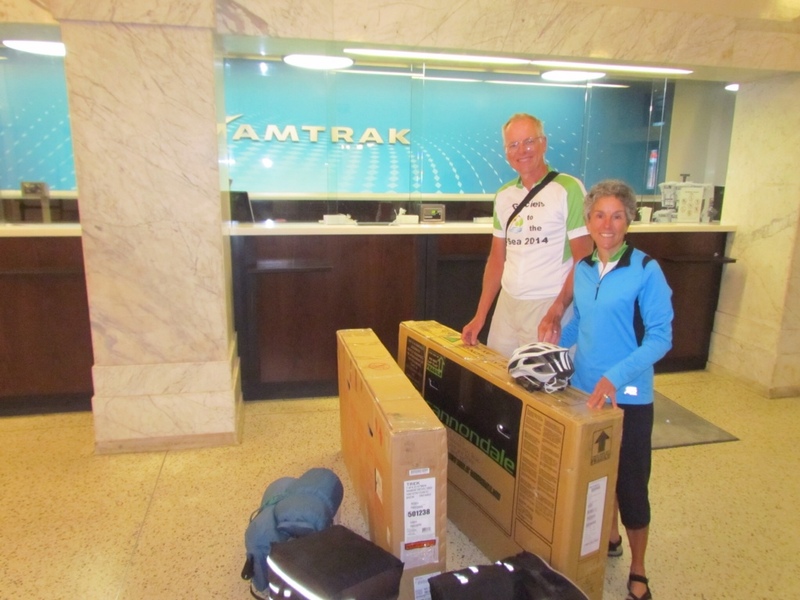 Amtrak's bicycle-friendly luggage policy made our one-way bike tour feasible, as well as providing an enjoyable journey. It became part of the overall experience. At only $10 apiece to check our bikes, Amtrak was a bargain. It did, however, require some preparation. Stephanie was kind enough to scour the local bike shops to secure boxes ahead of time for us. 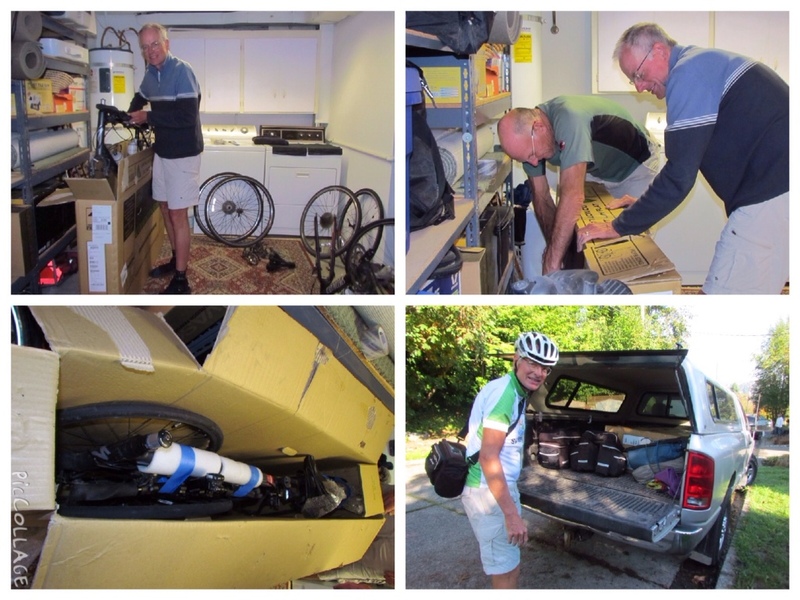 Guided by Scott's expertise, Rich disassembled and packed each bike securely for the trip. With that, it was a no-hassle check-in at Amtrak. Next year it will get even better. 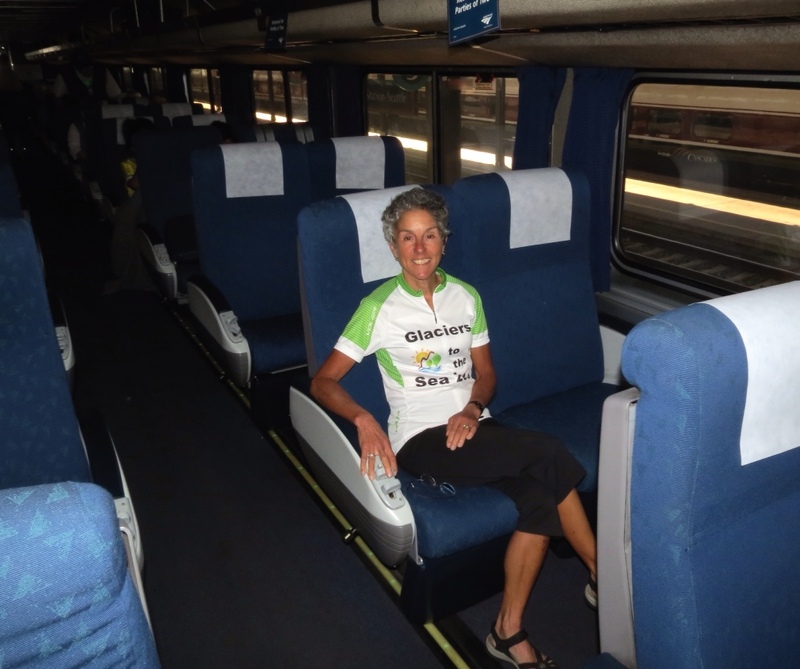 Amtrak has committed to providing new roll-on baggage cars for bikes on all their long-haul trains. The east-bound trip leaves in the early afternoon, which allowed plenty of daylight to see our way through the Cascade Mountains. With bright sunshine illuminating the fall colors, it was worth watching the scenery roll by. In contrast to airlines, the seats were well spaced and included footrests, and were very comfortable for sitting. Not so much for sleeping. Still, it was a smooth ride and nice to leave the driving and navigating to someone else for the duration. Arriving in Whitefish at 5:30am, we felt fortunate to be only an hour late. The west-bound train was already nine hours overdue. The oil boom in North Dakota has wreaked havoc with Amtrak's schedules, taking priority on the tracks. Our bikes arrived in perfect condition and Rich made quick work of putting them back together. Already the loaded bike felt foreign under me as we set off for the nearest café. 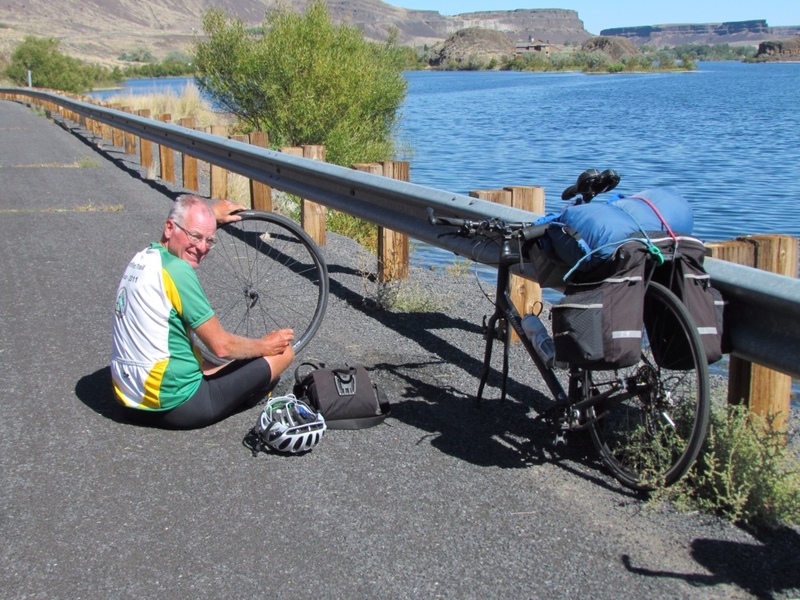 Although folks still saw us as touring cyclists, we had to admit the sad truth that we would cycle only four miles before surrendering the bikes to the car. But still it was nice to pretend. Our riding is taking a different form these days. Our bikes were safely stashed in the basement. With the tour officially completed, and the steep hills throughout Seattle, I felt justified in trading my cycling shoes for my only other pair of footwear. My Keens sandals just became walking shoes. 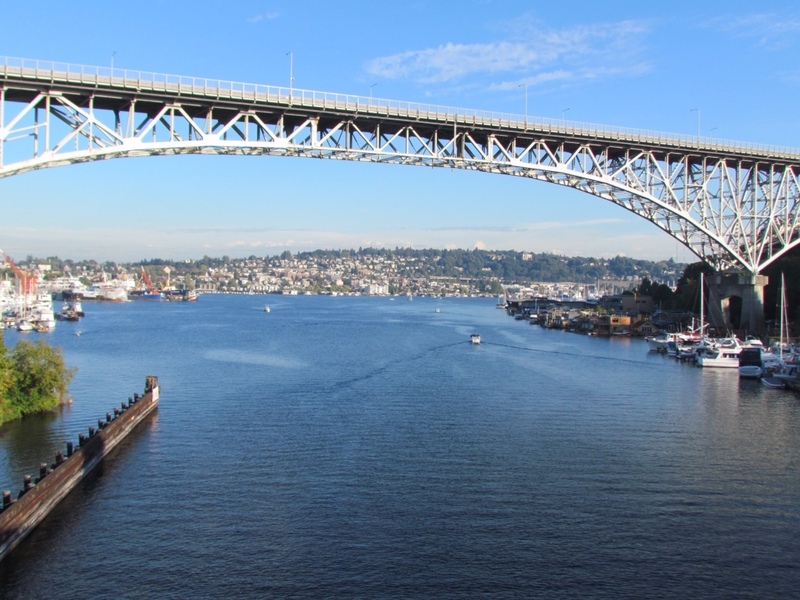 Our good weather fortune followed us to Seattle, gracing us with clear blue skies and days reaching the 70s. I shuddered to think that the temperatures back home were stuck in the 40s as I enjoyed two days of lovely warm sunshine. Our cycling friends, Stephanie and Scott, took us under their wing and pampered us with good company, excellent food and welcoming surroundings. We immediately agreed to their proposal to attend the pancake breakfast at the Swedish Institute. Filling ourselves on light rolled pancakes smothered in lingonberries to the accompaniment of accordion music, we were fascinated by the stories of a young family that had just returned from a year traveling around the world. Our mere month on the road paled in comparison. 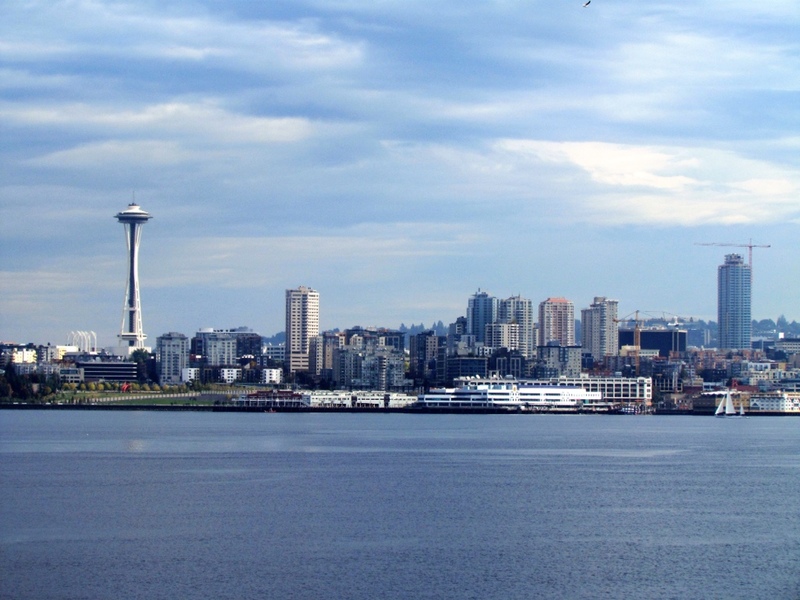 We'd been in Seattle several times before, but that still left plenty to explore. The eclectic area of Freemont was just across the bridge, and provided a fun place to walk. It was also a convenient location to meet a friend for coffee, where I marveled at the artistic prowess of the local baristas. Seattle is a coffee Mecca. Rich was content to adhere to having a rest day, but that term is not part of my vocabulary. So I ventured out on my own walking tour. 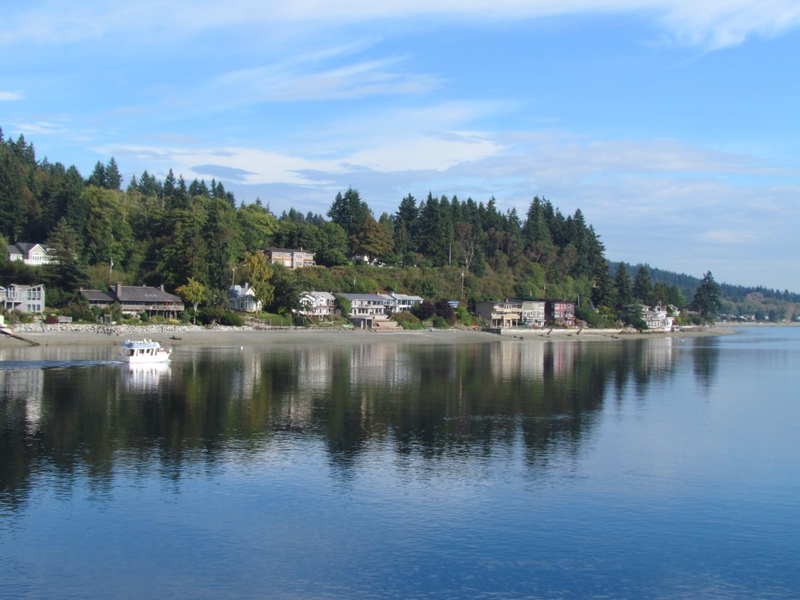 I thoroughly enjoyed the Queen Anne area where our friends live. It was alive with ethnic restaurants, boutiques, outdoor cafés and of course coffee shops which attracted all manner of customers. People watching at its best. I made my way down to Seattle Center, which I'd actually never seen before. It was pulsing with activity, largely populated by families. 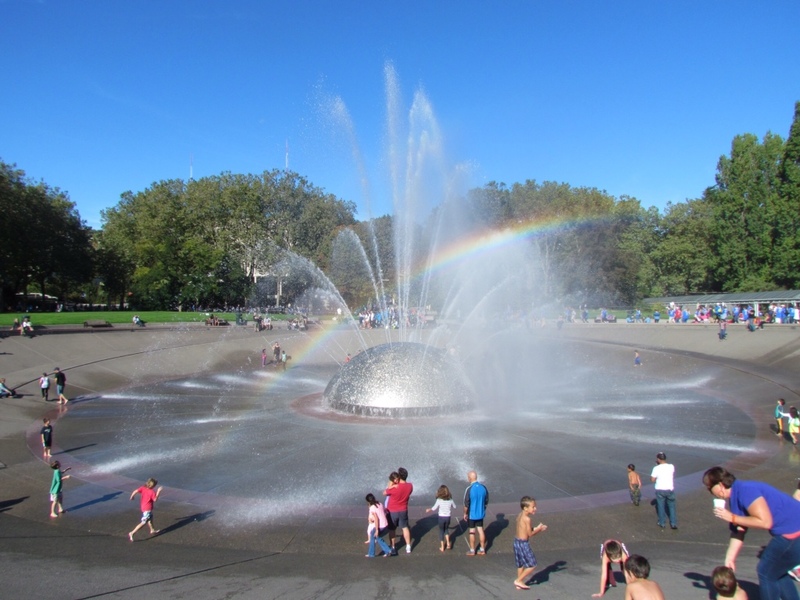 The sunny day seemed to bring out the joy in everyone, particularly those who were playing tag with the ever-changing patterns of water in the huge fountain. 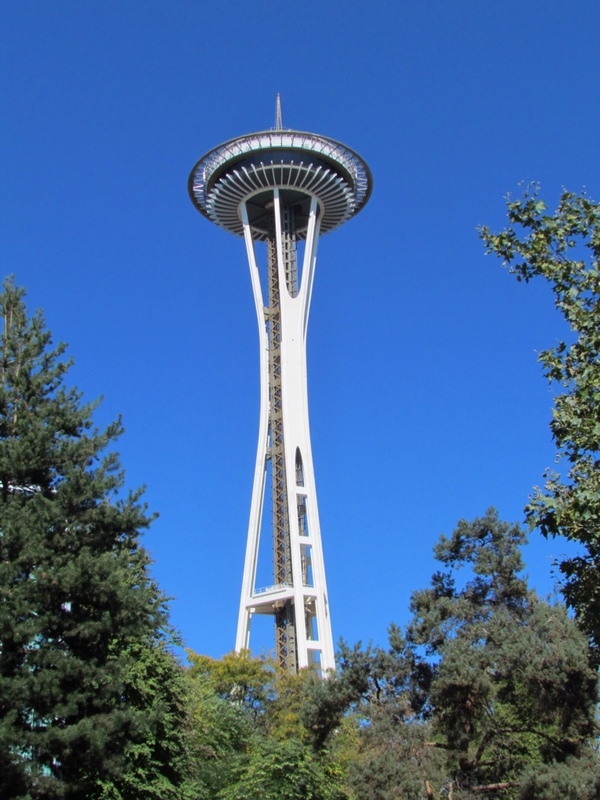 And of course, the Space Needle presided over everything. It was inevitable that I would make my way to Pike Place Market. 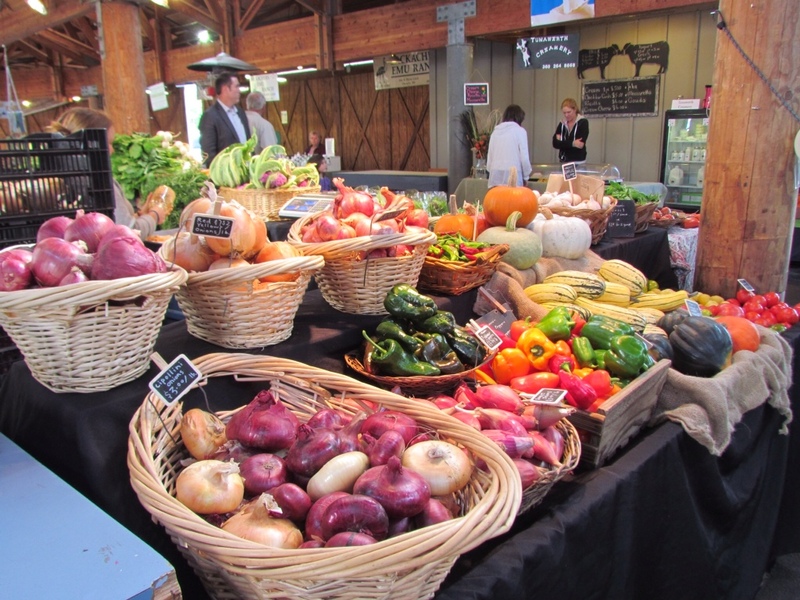 A lover of farmers' markets, I can't resist the sights, sounds and smells of the vendor displays vying for attention in that vibrant space. The ethnic shops surrounding the market are also a draw, offering so many options to tempt the palate and specialty goods to meet any niche need. 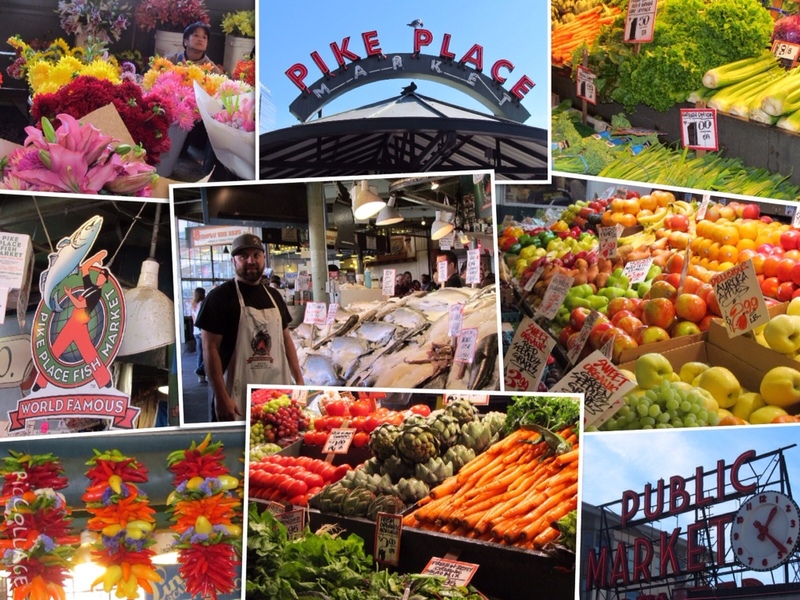 Pike Place has always been a favorite of mine. While my bike rested, my feet got a workout. And I covered just a little more of Seattle's bounty of offerings. It was a good trade off. All good things must come to an end. 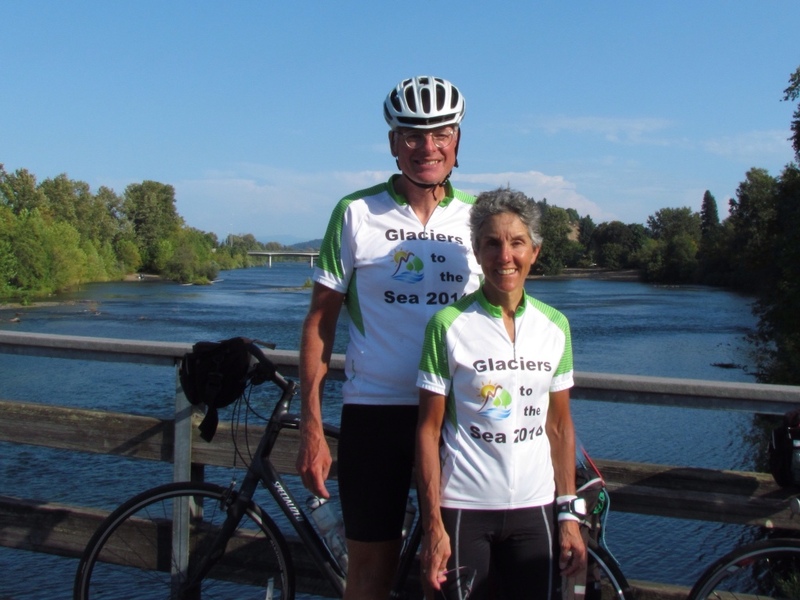 Including our Glaciers to the Sea cycling tour. 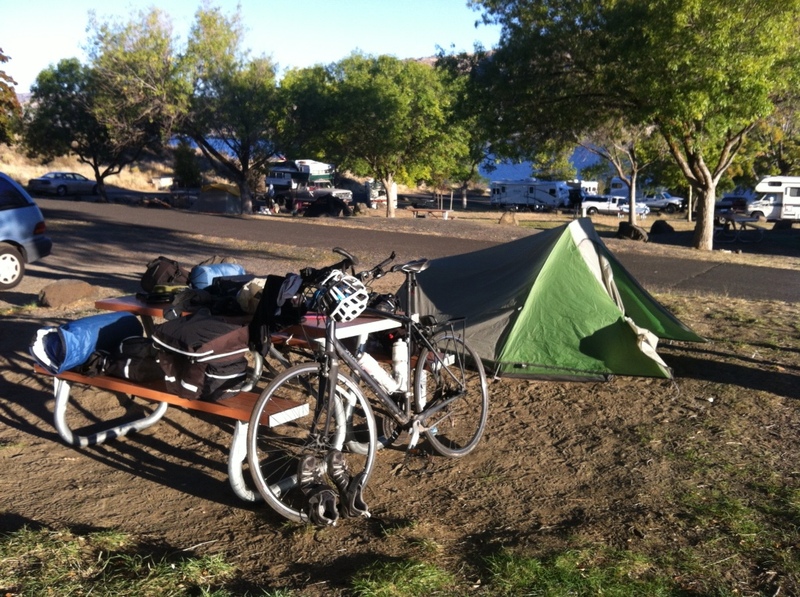 Interestingly enough, there seems to be a pattern to the final day of our long cycling trips. 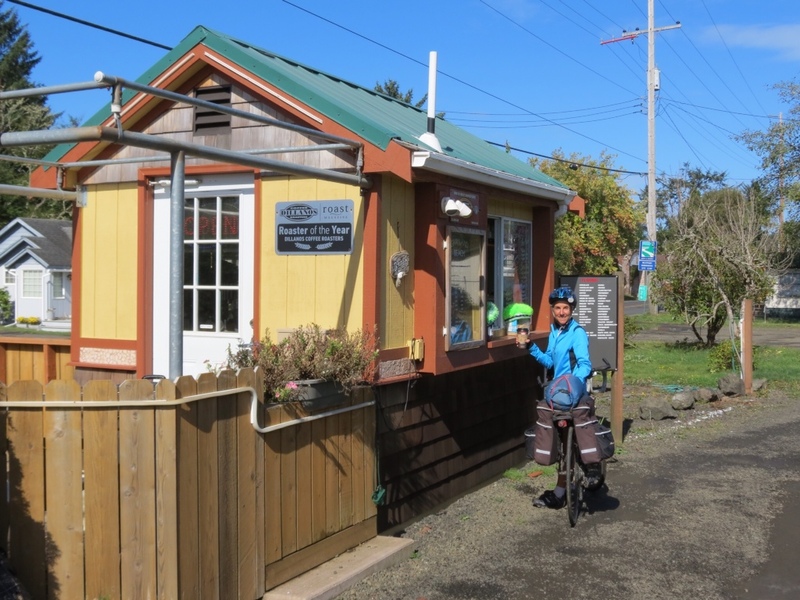 Last year, we completed the Grand Gaspé Tour with a 9 mile day. This year we topped that with cycling 11 miles to reach the finish line. And we added a bit of a twist to our finale. 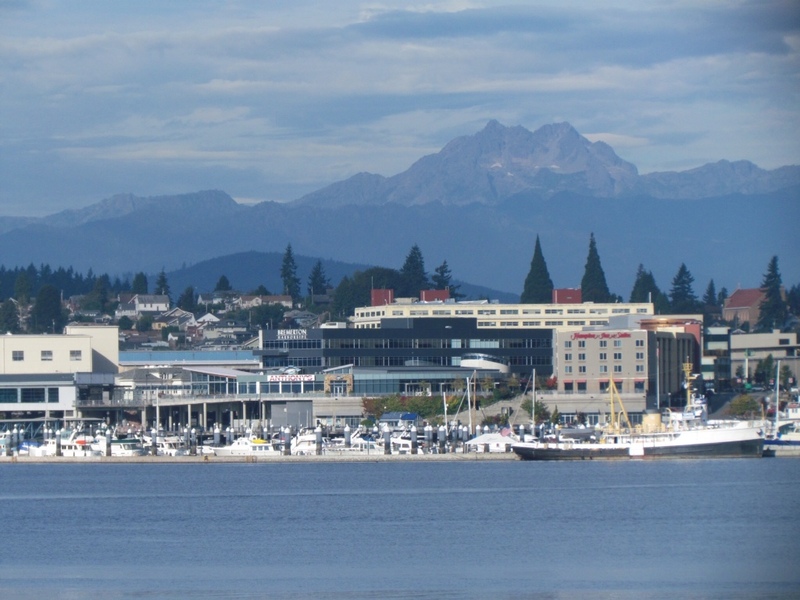 After a hilly ride yesterday and a particularly steep incline to reach our host home, we were relieved to coast downhill a short three miles to the waterfront in Bremerton. In that distance, we passed the 1,400 mile mark for our trip! At the water's edge we took time to enjoy the Harborside Fountain Park. 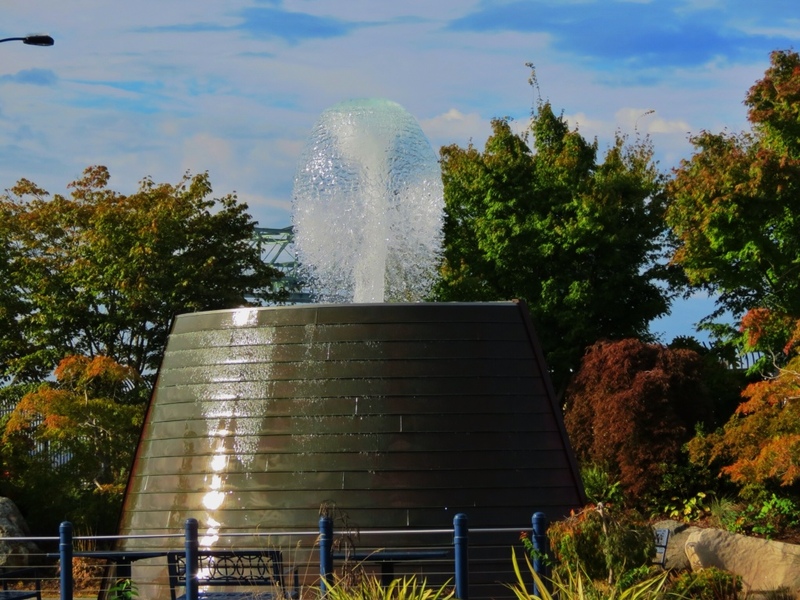 It is a unique tribute to the US submarine forces, with fountains that look like the fantail of a submarine. We thought they were cool enough with the water cascading down them, but soon found that they spouted out of the tops as well. 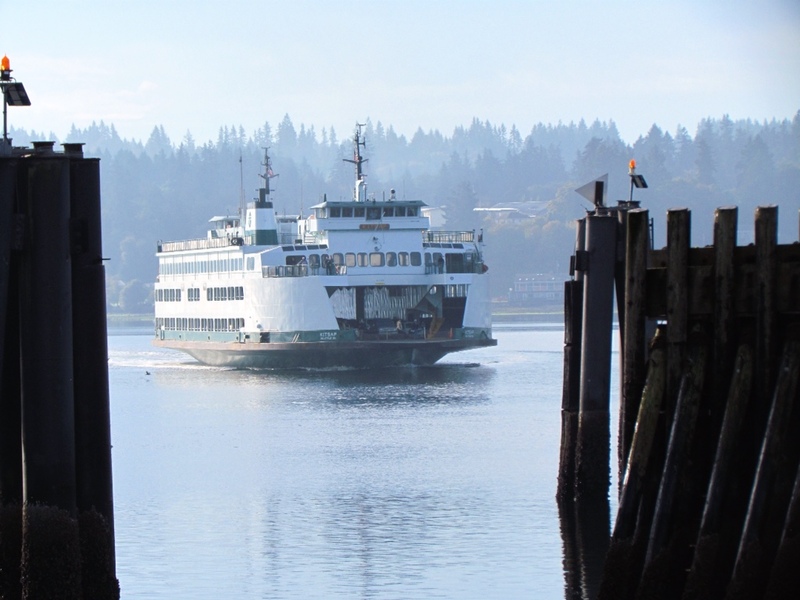 Our real purpose, however, was to take the ferry over to Seattle. Being cyclists afforded us the privilege of boarding first. We quickly headed out to the bow of the boat where we could take in the sights. The initial passageways were narrow and scenic, and it was comfortable outside watching the world slide by. Once we reached the larger bay it became windier and chillier, and we retreated behind windows where it was more comfortable. Docking in Seattle, we were met by our friends Stephanie and Scott. 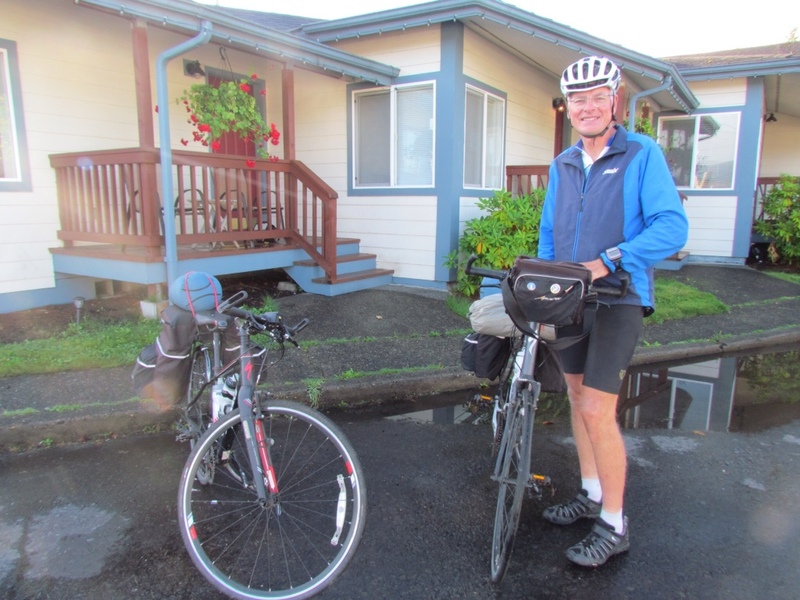 They arrived on bicycle, and we cycled the final 8 miles of our trip together. It was a pleasure to have someone else to lead the way, and most of it was on bike trails. With no hills. Arriving at their house meant the end of the trip. It should have felt like a momentous moment. But somehow it was all lost on me. I didn't feel a sense of accomplishment, relief or celebration as I dismounted my bike. It felt like any other time I got off my bike and removed my panniers for the day. We were already deep in conversation with Stephanie and Scott and eager to see their new house. 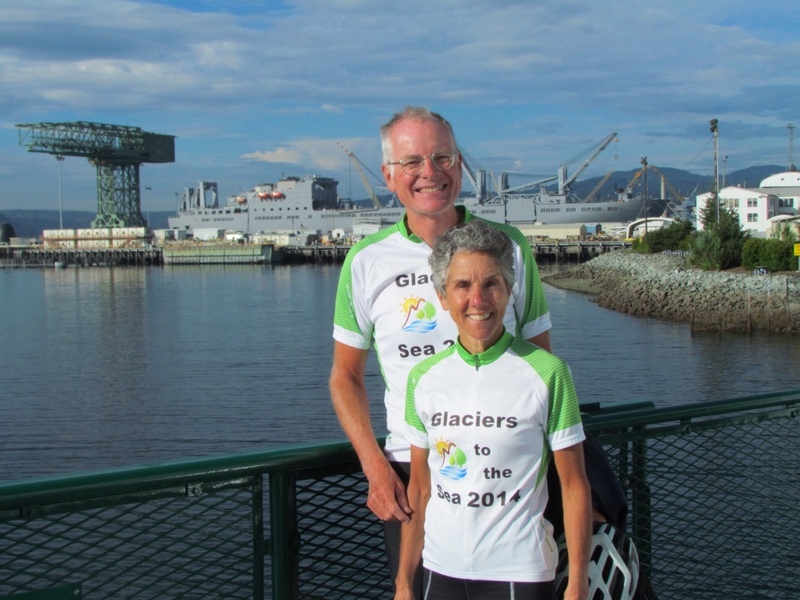 After all, they had been our Warm Showers guests last summer as they cycled their way across the country. So it felt a natural and fitting finish to our ride. We left the Glaciers a month ago, and made it to the Sea. All our miles are behind us. At least for now. I'd never realized before just how extensive and meandering Puget Sound is. It's long and sinewy fingers stretch well inland, creating endless miles of coastline. We enjoyed exploring quite a few of them. Our first introduction was in Olympia. 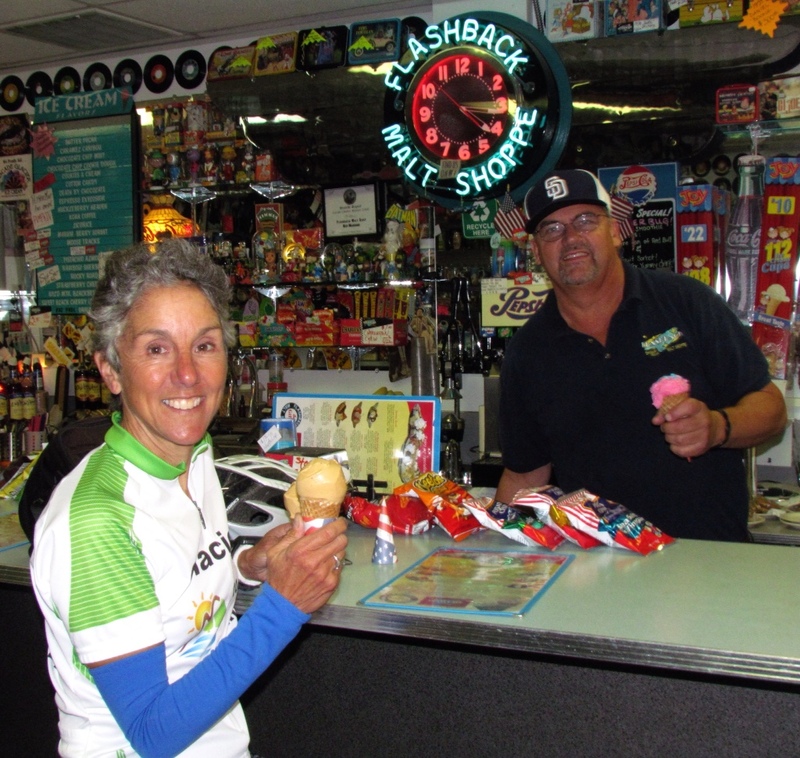 We had the luxury of a rest day there spent with my good friend, Anne, who shared her favorite outdoor haunts with us. 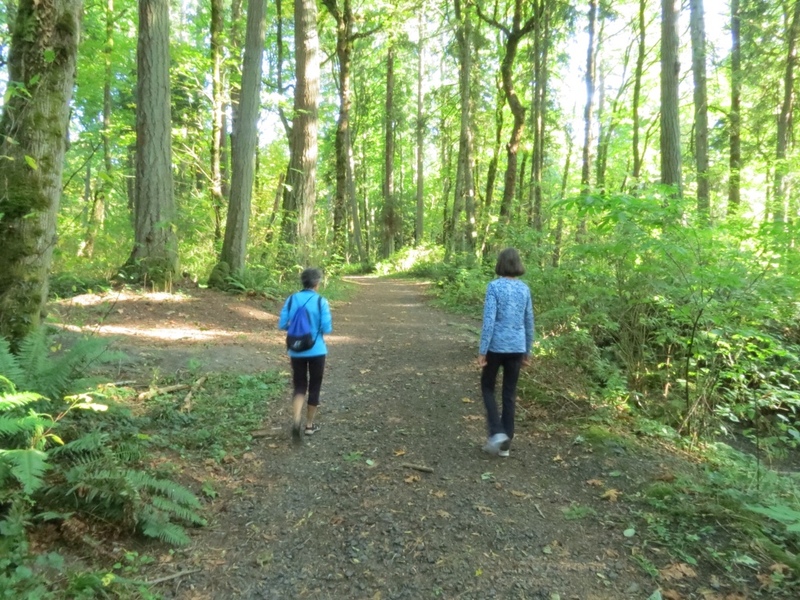 Blessed with sunny calm weather, we happily traded our bikes for walking and enjoying nature. 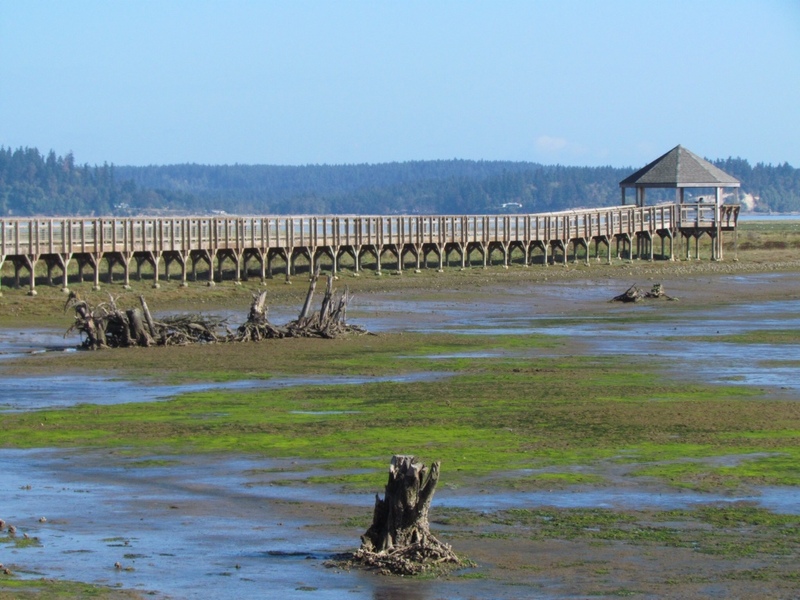 Exploring the restored delta on the boardwalk at the Nisqually National Wildlife Refuge. 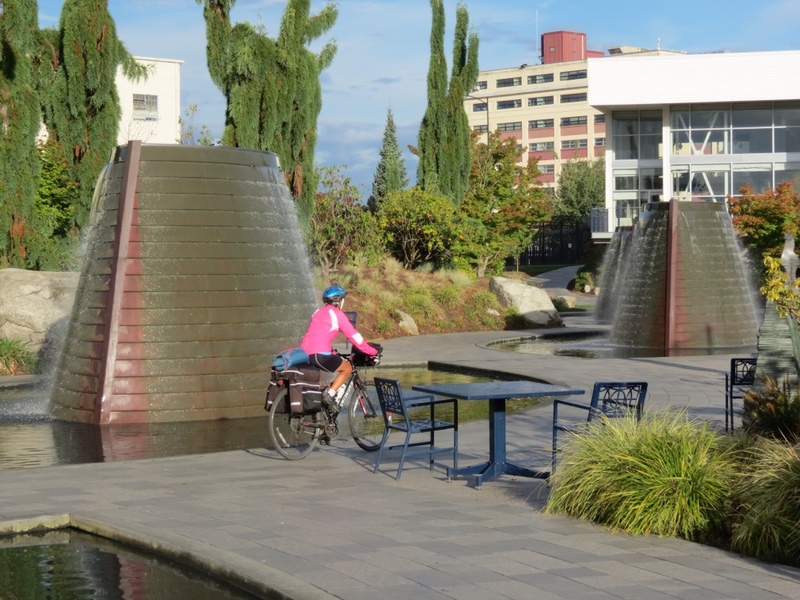 We were advised that the best bicycle route into Seattle was not the direct one. 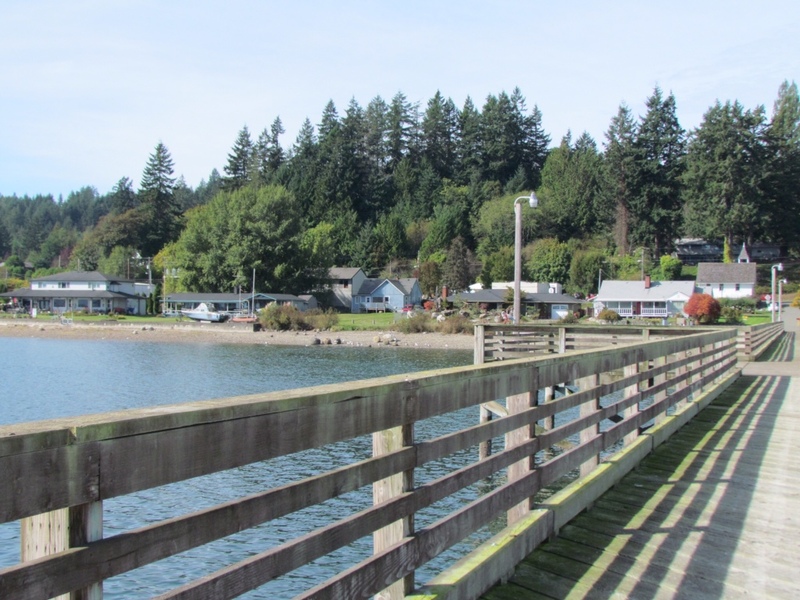 It took a full day of cycling to circle around to Bremerton, on the western side of the Sound. But it was far more pleasant and less stressful then trying to navigate through a busy metropolitan area. Every time we had a scenic view of water, it turned out to be another bit of the Sound. 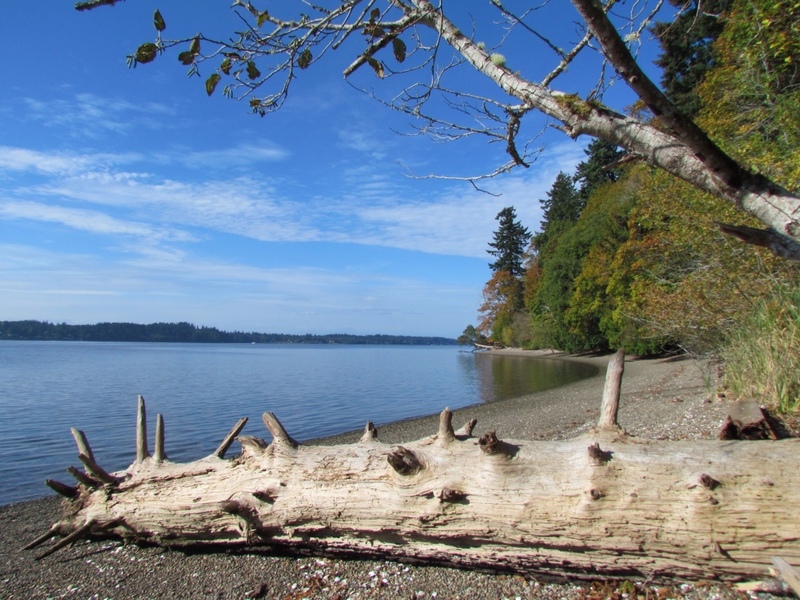 The sight varied greatly depending on the status of the tide and the nature of the shoreline. It could never be tiresome. 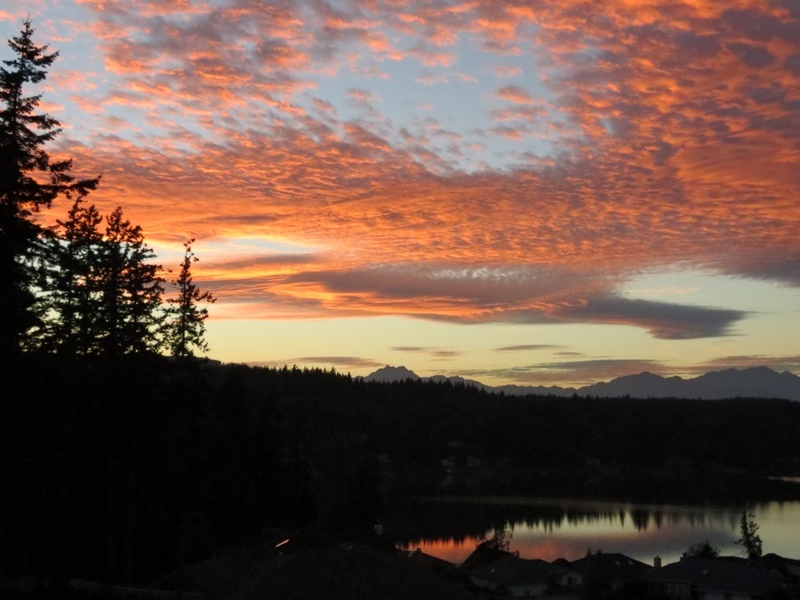 Our Warm Showers hosts in Bremerton had a beautiful home with a wonderful view of Kitsap Lake. 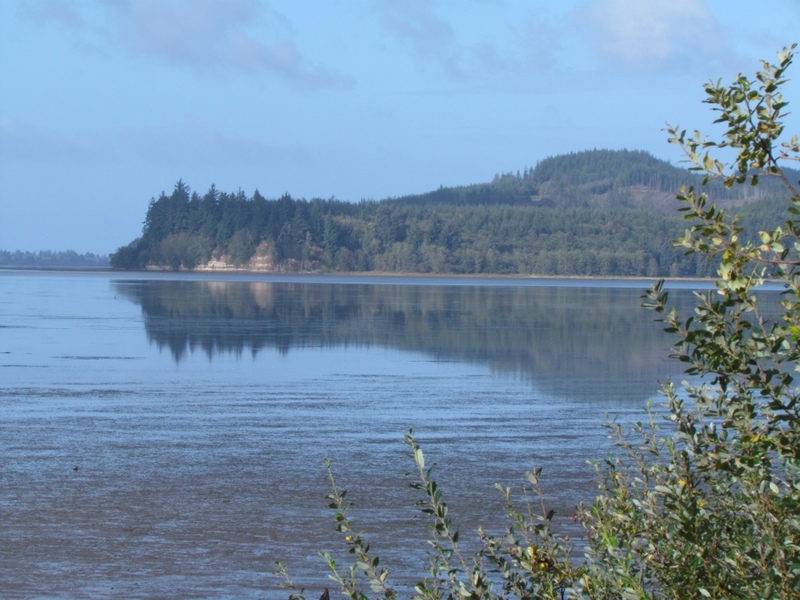 Although not part of the Sound, its waters eventually drain there. 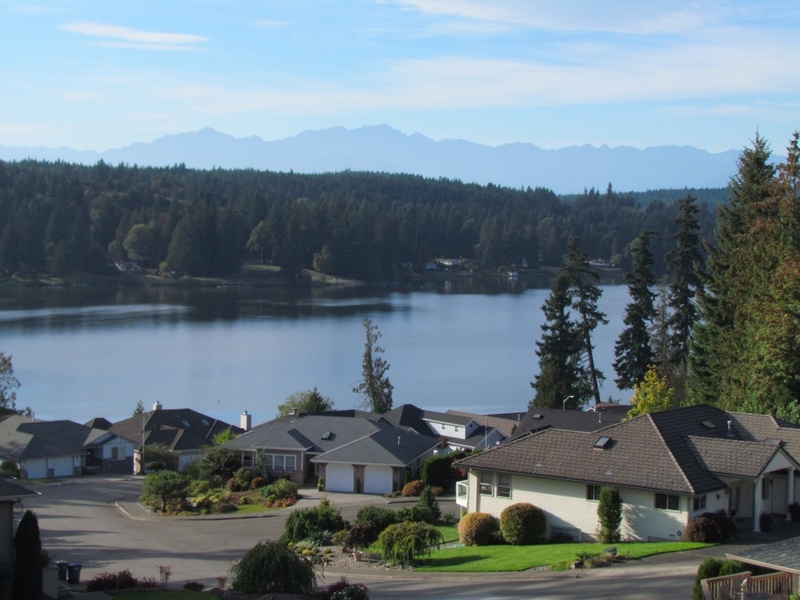 The unseasonably warm weather provided a fine opportunity to hang out on the deck to enjoy the view, including the Cascade Mountains in the distance. 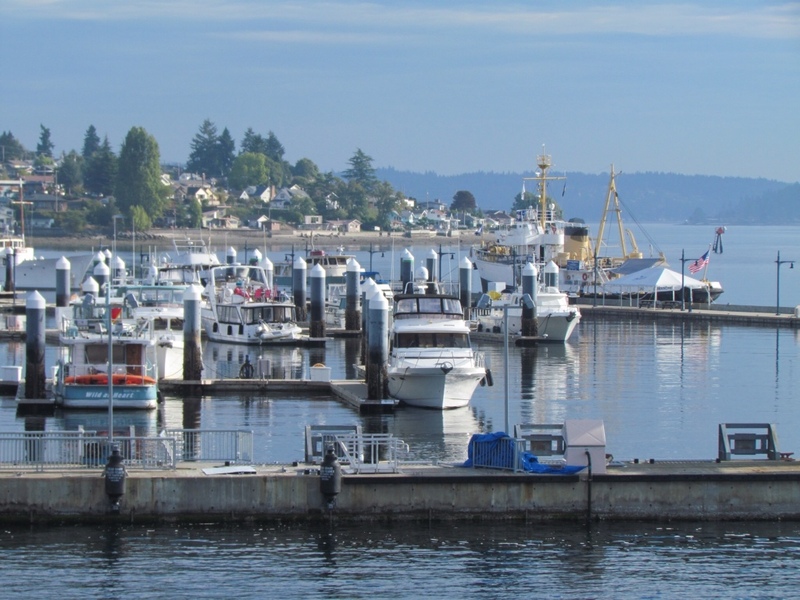 Tomorrow we will complete our circuit of Puget Sound, as well as our trip. Since we didn't do a circle route this time, let's just say we are about to come full cycle. No matter how long the trip, when we get near the end I am reluctant to let go. We have our daily cycling down to a well tuned routine, and it feels good. My body is strong and I love pressing through each day's miles. The simplicity of life on the road appeals to me. And I admit that I enjoy being able to eat the large quantities of food to takes to fuel all that cycling. Even after coming through a full day of rain, I want to keep going. 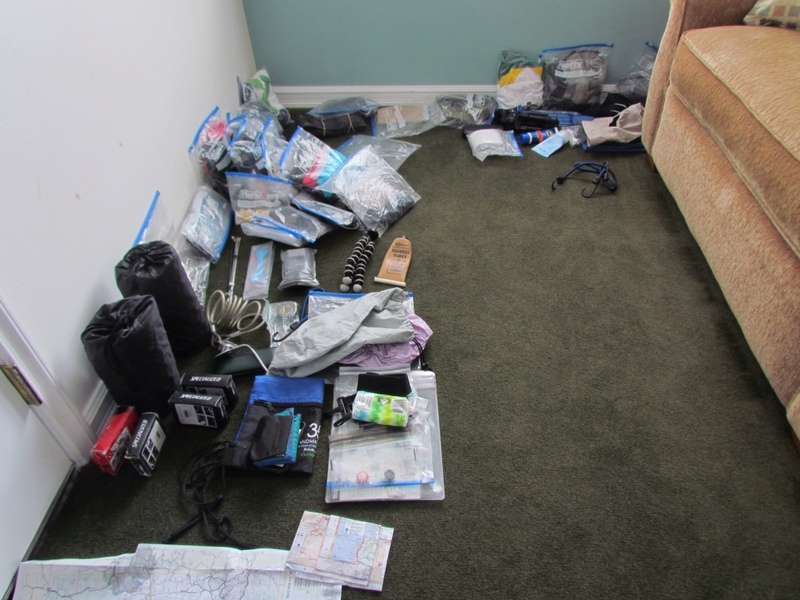 The cold, wet clammy clothes are already a distant memory, as is the damp smell as we aired out the ziplock bags holding all our belongings in the motel room. Setting off this morning amidst the remaining puddles, the fog was just lifting and we had no idea that we'd spend the entire day under clear blue skies and sunshine. I'm going to miss those miracles of nature that mean so much in the life of a touring cyclist. It's time to start savoring the lasts. This is the last night we stay in a motel. Our last Warm Showers hosts. The last of my peanutbutter, as its tube grows thin. The last of the countryside before heading into the greater Seattle area. The last time we wash our clothes in the sink. Okay, so maybe “savor” doesn't apply to them all. 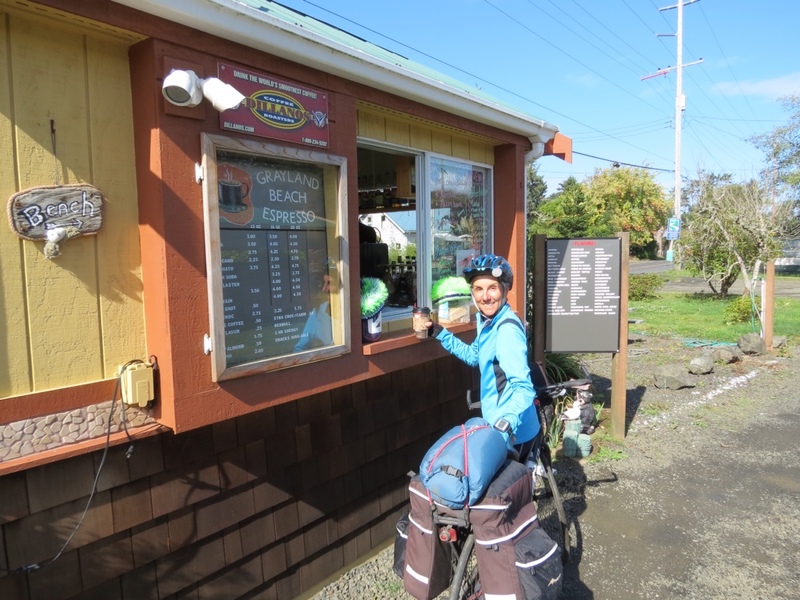 For weeks, I've marveled at all the little drive-up espresso booths we see everywhere, even in the smallest of towns. I've been itching to ride through one on my bike. With time dwindling, I took the opportunity today. 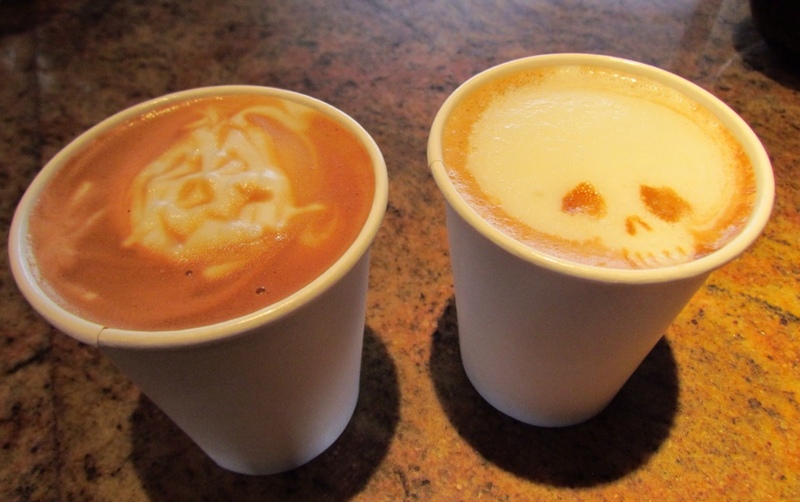 “A medium skim latte, please.” An excellent morning caffeine fix. I said goodbye to the coast today. How I've enjoyed it's views, it's waves, it's rocky coastline and beaches. I love cycling along water. It must come from growing up on Lake Superior. Turning inland was a clear sign of reaching the end. 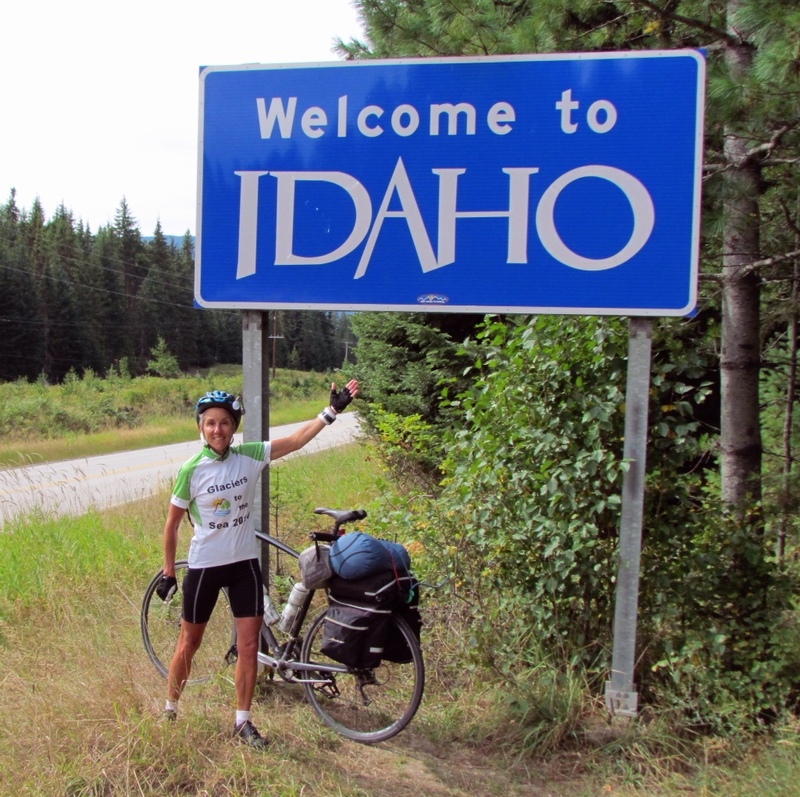 We have almost 1,300 miles behind us, and just two full days of cycling left to go. It's no coincidence that this evening's dinner conversation focused on ideas and options for our next big cycling trip. It's easier to let go knowing there are more destinations in store for us. Just barely. It's better than focusing on the countdown.